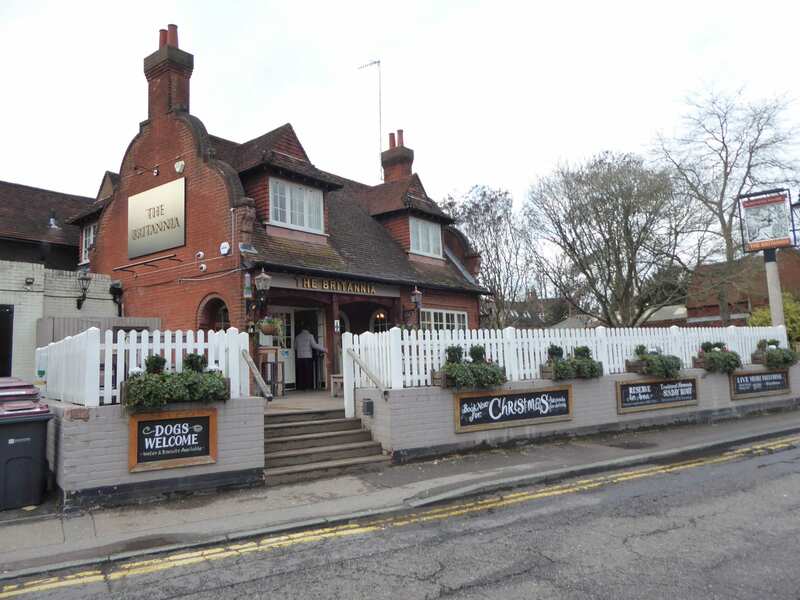 Home » architecture » Clubs'N'Pubs » Comments » cookery » Countries » Cuisine » Europe » Featured Articles » tours » Travel » UK » wine » Britannia, Guildford – Pub Chain Food can be Good! 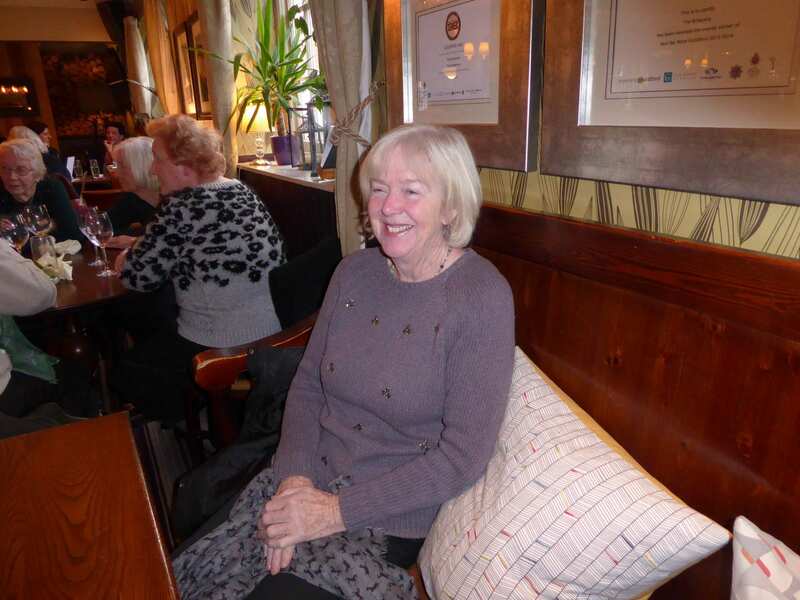 Lyn meets her friend for lunch in the Britannia, in Guildford. I’d always been inclined to avoid eating in pub chains that all have the same menu. It used to mean tasteless, pre-packed, microwaved meals. 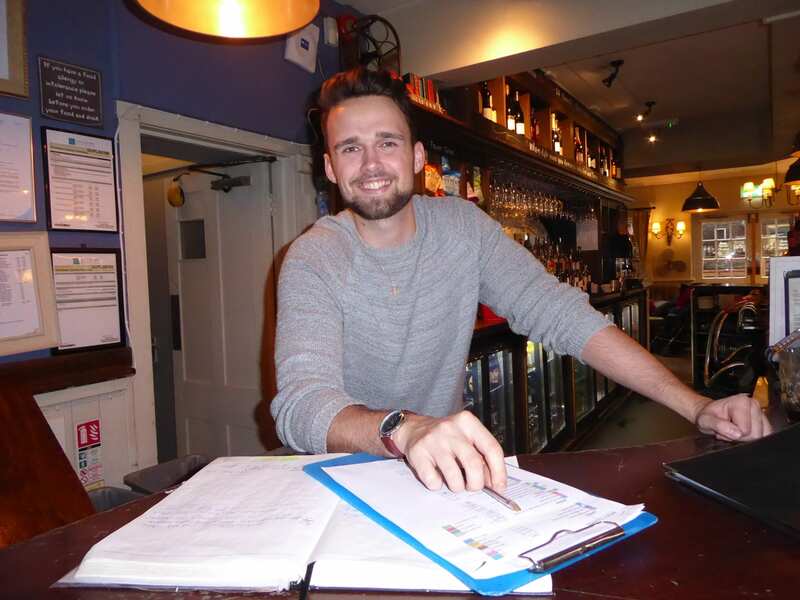 But now, pub chains like Shepherd Neame all have the same menu, but the ingredients are sourced locally and cooked by the individual chefs, so they taste good and fresh, and can vary slightly from pub to pub. 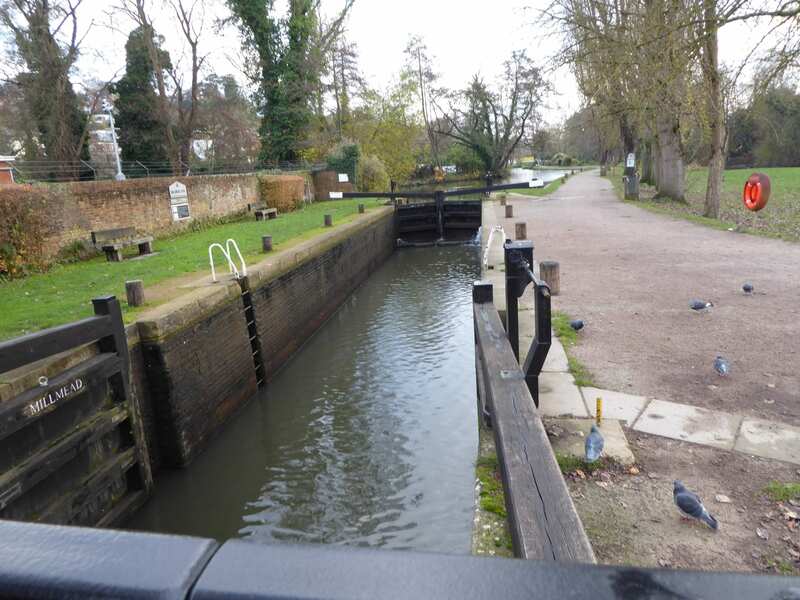 I went to Guildford on a coach trip, so my old schoolfriend Charlotte, who lives there, and I arranged to meet in the Britannia beside the river. It was easy for me to find it. The Britannia was built at the beginning of the 20th century. The previous wooden pub had burnt down, killing the landlady. 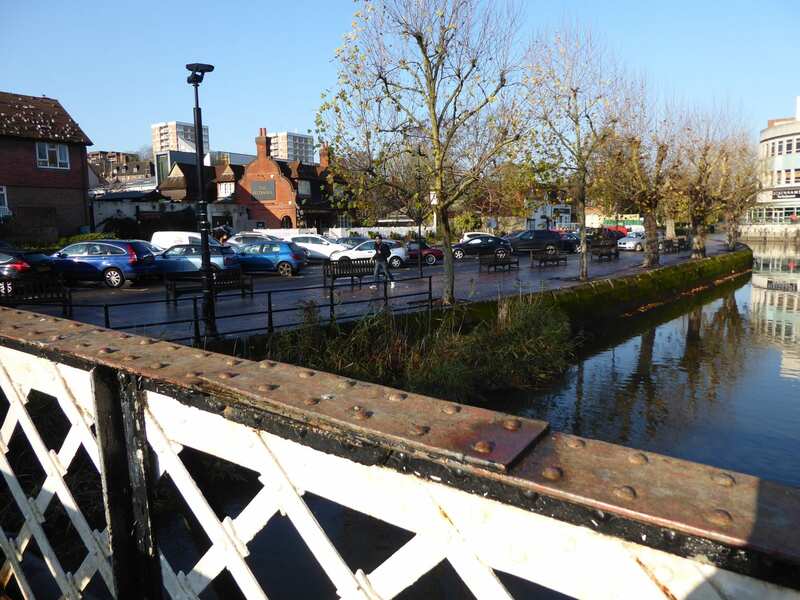 Shepherd Neame, Britain’s oldest brewery, bought the pub ten years ago, but unfortunately for them, in 2013 the River Wey burst its banks, flooding Guildford and the pub. Now it’s a welcoming pub for all ages, with fleece blankets if you want to sit outside, and a stack of doggy beds for furry customers! I noted with a laugh that they have a Ukulele group there, plus a ukulele behind the bar.. Since I saw the Ukulele Orchestra of Great Britain, I see ukuleles everywhere! 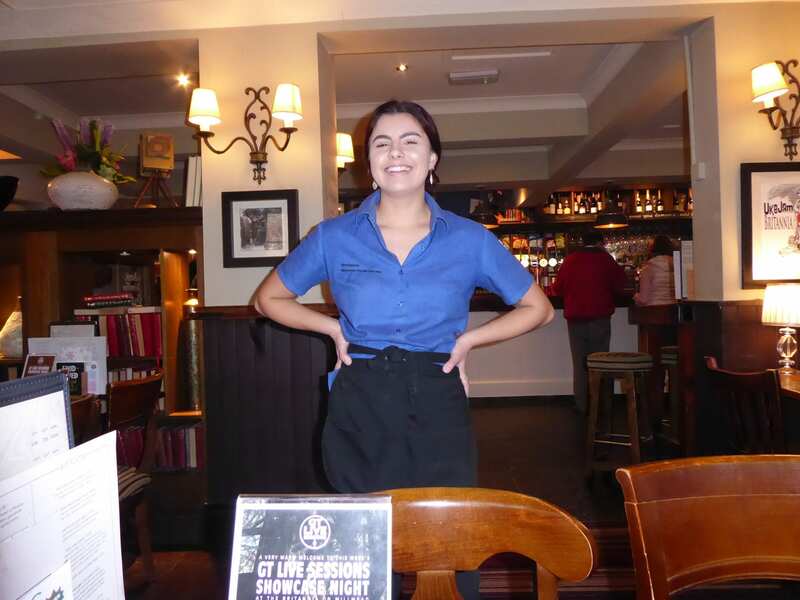 Tara, the Deputy Manager, welcomed us, Alastair prepared the drinks and Gabby the waitress took our orders. I had a wonderful lager-like drink called Bear Island East Coast Pale Ale. It had the most amazing flavours, like hops, vanilla, fruit and more! I’ve never seen it anywhere else, but it’s well worth looking out for! Charlotte had a white wine. 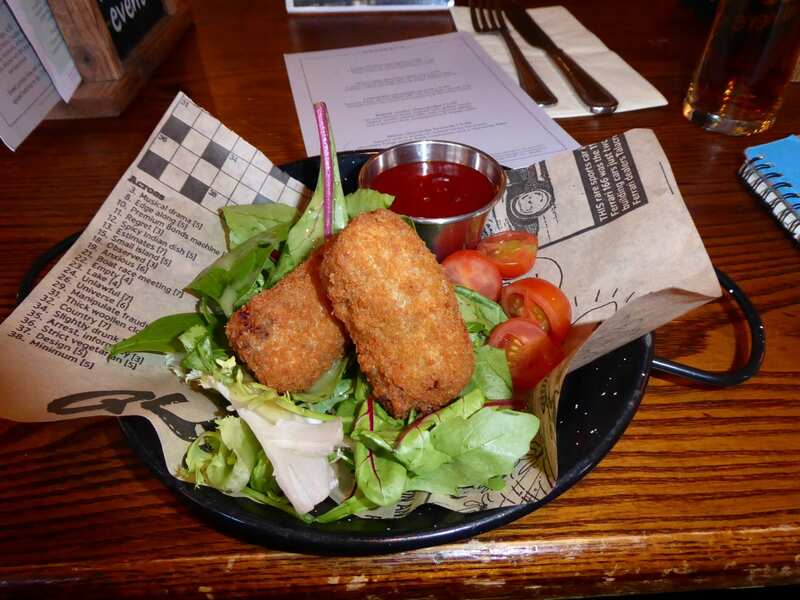 For starters, I chose Smoked haddock and Cheddar croquettes encased in a golden crumb with balsamic dressed leaves and spicy Tandoori ketchup for dipping. £5.95. 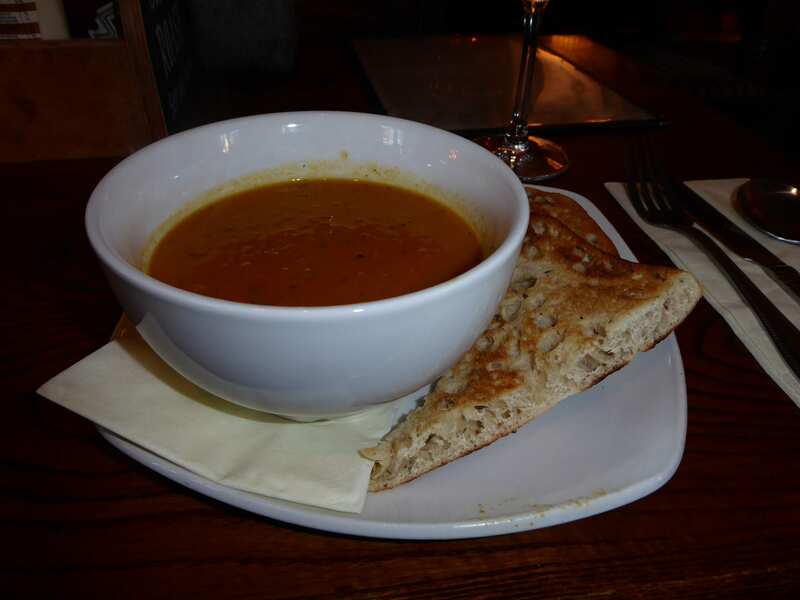 Charlotte had the Soup of the Day, which was Carrot, with crusty bread. £4.95. I think my Croquettes were pre-made, but they were presented attractively, and were an unusual, enjoyable starter. Charlotte’s soup was a perfect Winter soup and just the right consistency. 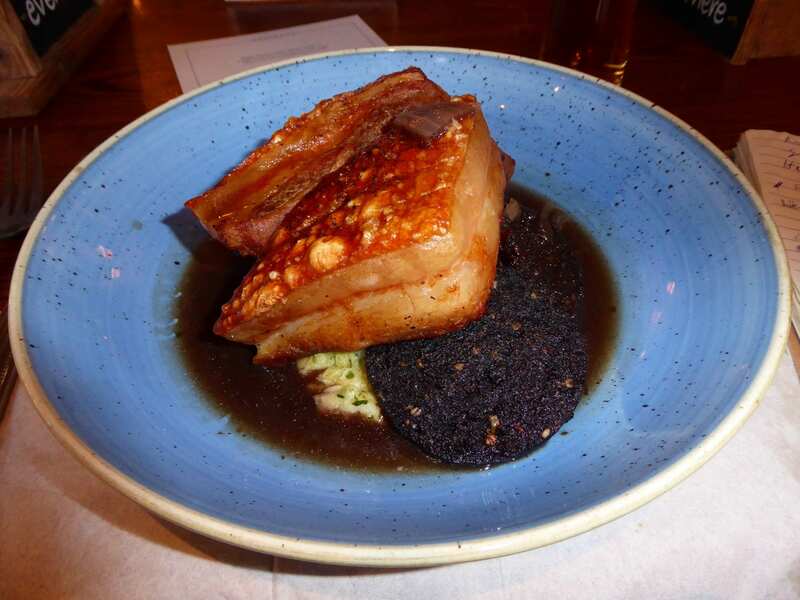 For our main course, I went for the Roast British pork belly, with crispy black pudding, bubble and squeak mashed potato, and a rich onion gravy. £12.95. 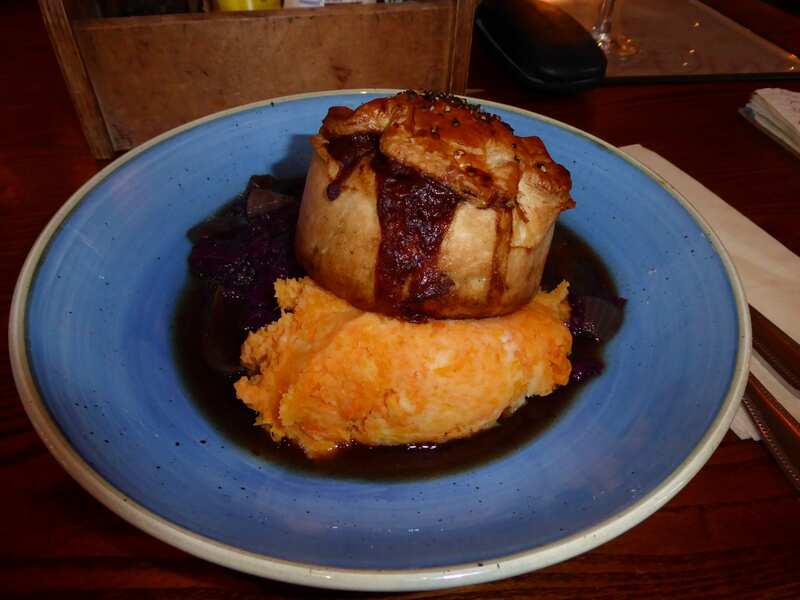 Charlotte chose Beef steak and ale pie, with a creamy butternut squash and sweet potato mash, braised red cabbage with apple and a rich red wine gravy. £10.95. I award the pork belly 100%! The fat had melted out of it, and it had perfect crackling. Charlotte’s pie looked home-made and had a large, moist meat filling. Just one criticism here; I think the red cabbage with apple should have been served with the pork belly instead of with the pie, or possibly with both. 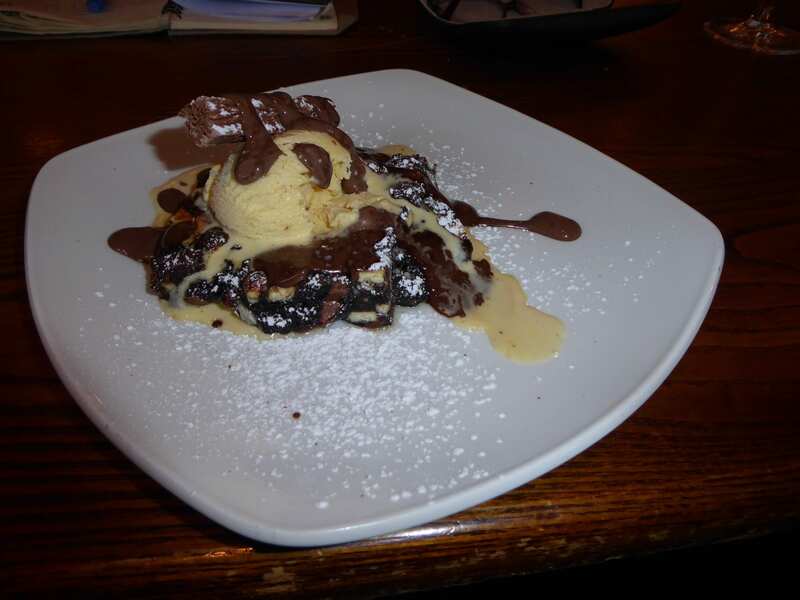 Although we thought we were full, we couldn’t resist the Dessert menu. I had a Tangy blackcurrant delice, which was a fluffy mousse on a biscuit base with tangy lemon curd and a caramelised pecan crumb. £5.95. Warm chocolate brownie topped with a scoop of clotted cream ice cream, chocolate fudge sauce, fresh raspberries and a chocolate flake, £5.95 was Charlotte’s choice. 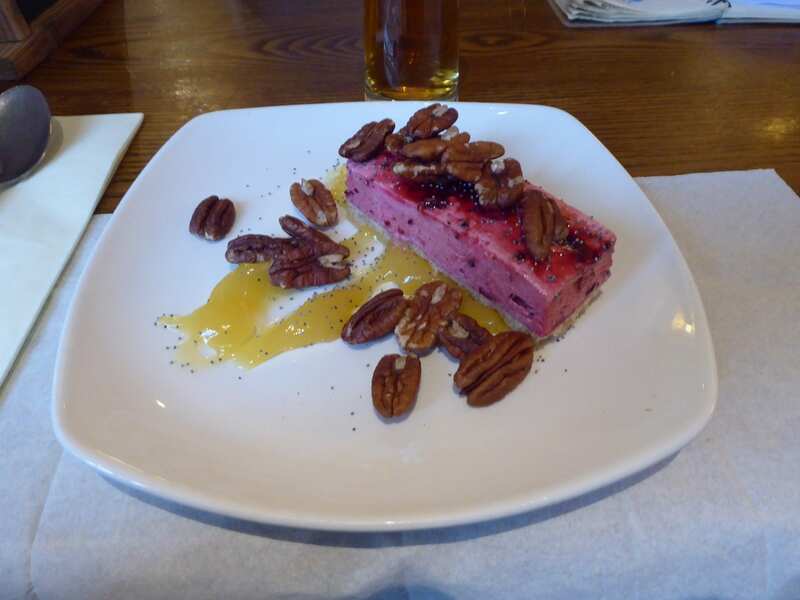 I looked at the blackcurrant delice, which really did look fluffy and light, and my eyes passed on the message to my stomach, which shifted obligingly and made enough room to slide most of my pud into the corners. It went down a treat, and was as light as it looked, and very refreshing. One criticism; the pecans were whole, not crumbed, and there were far too many. Three of them would have been enough. Charlotte declared her brownie delicious and very chocolatey. It was a very pleasant lunchtime. 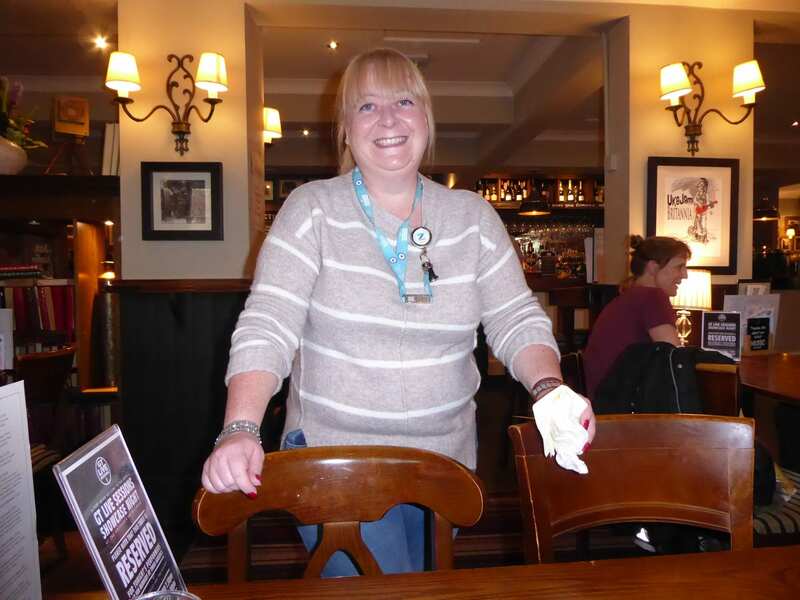 It was great to see my friend again, the seating is comfortable and not too crammed together, and the staff were friendly, relaxed and organised. Next time I go to Guildford we’ll definitely meet in the Britannia again!